to maximize their learning potential and overall well-being. I still believe that education is the great equalizer in our society." Dr. Tracy Geist has been a Social Worker with the capital Area Intermediate Unit since 2002. Along with her generic caseload, Tracy coordinates the CAIU therapy dog program and is a facilitator for adventure-based experiential activities. Tracy was the innovator of the CAIU therapy dog program which has had a profound impact on the mental health of seriously emotionally disturbed children and the staff who work with them. Tracy recently completed her PhD. through Widener University where her dissertation focused on the impact of animal assisted therapy on the welfare of emotionally disturbed children. Tracy is emerging as an expert in the field of animal assisted therapy and this fall she will be presenting at the National Conference on Advancing School Mental Health, in Alexandria VA, hosted by the Center for School Mental Health (CSMH) and the IDEA Partnership (funded by the Office of Special Education Programs (OSEP), sponsored by the National Association of State Directors of Special Education). Tracy has received extensive training in adventure facilitation and also served as an Associate Trainer for Project Adventure. She works primarily with school age groups and, in addition to canoe and wilderness activities, she is a staff trainer for our ropes course. An accomplished fisherwoman, Tracy oversees our fishing skills program which incorporates the PA Fish and Boat Commission program. "We have a great ropes course and the staff are amazing. Tracy obtained her M.A in Counseling Psychology from Towson State University and a B.A. in Psychology and Sociology from Messiah College. She also is a Pennsylvania certified Home School Visitor. Prior to coming to the CAIU she worked as a Supervisor for the Children's Case Management Unit, Director of the Dauphin County Student Assistance Program, and as a Family Based Therapist for Keystone Children and Family Services. It was at Keystone that she first began to use therapy dogs through their Susquehanna Service Dogs program. Tracy also has taught courses as an Adjunct Instructor for Messiah College and she will be teaching courses for Widener University this fall. and the impact of that on education. …the future that otherwise looks incredibly dark for us all”. A prodigious yet discerning coffee drinker, Tracy hails from West Virginia . 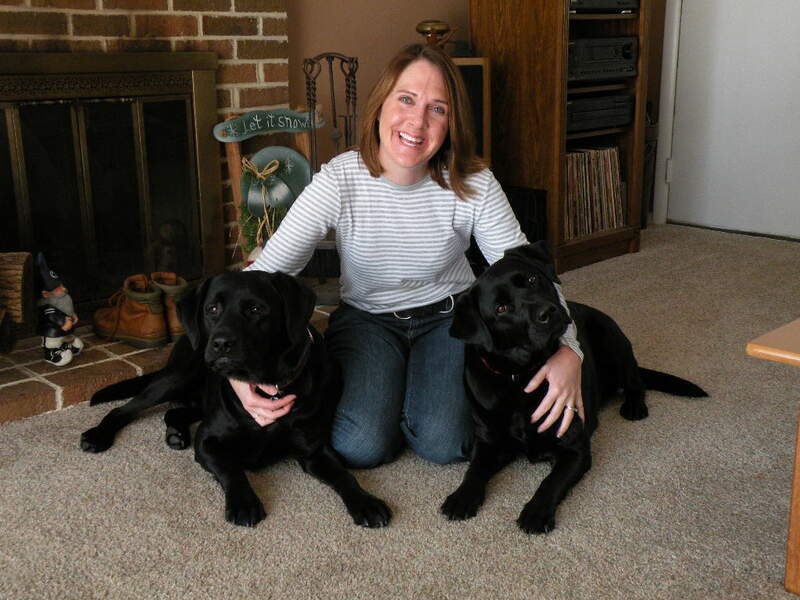 Tracy is a volunteer for Susquehanna Service Dogs and can be seen about with her dog Scarlet, who also has mothered several other service dogs and Stuart, her newest dog in training.